In the first match of Thursday's doubleheader in the Masters Champions League (MCL), the Sagittarius Strikers took on a winless Libra Legends. The Strikers were hoping to get their second win of the season after losing their previous game. The Jacques Kallis-led Legends were looking for their first win of the campaign. 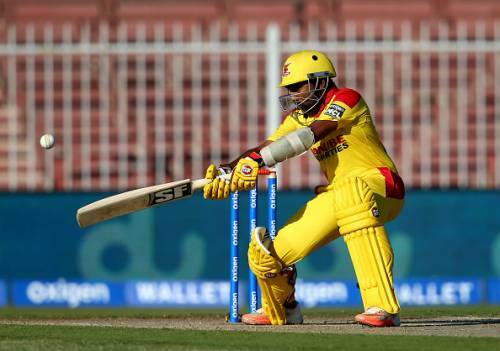 With the Pakistan Super League (PSL) that is scheduled to be played at the Dubai International Stadium from February 4 onwards, this was the first MCL match to be played at the Sharjah Cricket Stadium. The Adam Gilchrist-led Strikers won the toss and elected to bat first. It turned out to be the right choice as the Strikers got off to a breezy start as openers Gilchrist and Mahela Jayawardene piled on the runs in the initial overs. Both former national captains put on 102 runs for the first wicket in just 9.5 overs. Jayawardene reached his fifty in just 34 balls. Gilchrist was the first to go as his shot hit straight back down the ground was latched on to brilliantly by Nicky Boje, off his own bowling. Jayawardene continued playing some classy shots, rolling back the years, timing the ball to perfection. First, he went to overtake his countryman, Kumar Sangakkara's 86, which was the highest score in the MCL so far. The 38-year-old Sri Lankan went on to achieve the feat of scoring the first hundred of the MCL as he scored a fabulous knock of 124 off just 60 balls that included ten fours and nine sixes. Other middle order batsmen of the Strikers also made useful contributions to help their team reach a mammoth total of 227/3 in 20 overs. None of the Legends’ bowlers were able to contain the opposition batsmen and went for plenty of runs. In reply, the Legends faced similar problems that they have been facing in all their matches played so far – losing wickets at regular intervals, thus failing to build any sort of meaningful partnership. At 45/3, it seemed like the Legends were going to face a humiliating defeat. However, Sean Ervine saved the Legends from an embarrassment as he scored a quickfire fifty. Ervine four fours and five sixes in his 20-ball knock of 55. None of the other batsmen were able to provide any sort of constant support to give the Legends any chance to chase down the target. Shane Bond showed why he was one of the most feared bowlers in his time as he conceded only 11 runs in three overs and picked up two wickets. Fellow Kiwi, Daniel Vettori also picked up two wickets in addition to bowling a maiden over. With the win, the Strikers are up to second place now, just behind the unbeaten Gemini Arabians. The Libra Legends are the only team without a win the tournament and languish at the bottom of the table. Brief Scores: Sagittarius Strikers 227/3, 20 overs (Jayawardene 124, Gilchrist 38; Boje 1/21) beat Libra Legends 164/7, 20 overs (Sean Ervine 55, Kallis 25; Bond 2/11, Vettori 2/32) by 63 runs. IPL history: Kochi Tuskers Kerala squad - Where are they now?